Create unique permanent designs or update old clothing with Neon Fabric Spray paints (4pack). Ideal for arts and crafts enthusiasts. Create unique permanent designs or update old clothing with Neon Fabric Spray paints which come in green, pink, yellow and orange and are ideal for any arts or crafts enthusiasts. Simply pump to spray and the bottle will release the hot neon colour of your choice to produce funky and flamboyant colour effects. For best results the neon paints work best on light or white fabrics as the colour stands out more and dries in four hours. They becomes washable (inside out) in 72 hours, for example t-shirts or jumpers. UV reactive face and body paint in a range of great colours. This bright neon paint glow brightly under blacklight or UV light used in most clubs..
Customise outfits, accessories and costumes with your own creative designs that'll glow brightly in the dark. 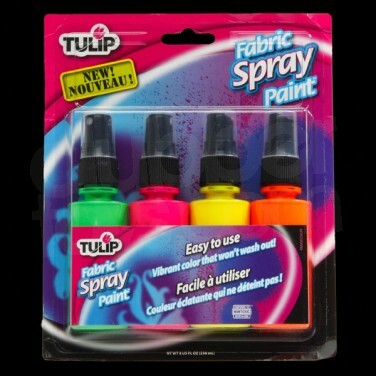 Fantastic fun for parties and everyday use, add a little glow with Tulip Glow Fabric Paint. Rock the party in your very funky Glow Headphones T-Shirt. Glow in the dark earphones appear to sit around your neck to complete an effortlessly cool look.